Max Boyd, Roswell DT 6’0″ 260 lbs. Boyd helped lead his very talented Roswell Hornets to victory over the reigning 2x state champions, the Colquitt County Packers. 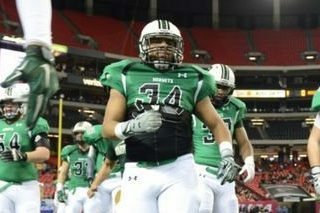 Roswell avenged a loss from the state finals last year in the Georgia Dome in dominating fashion in a final score of 34-3 in front of a packed house at Ray Manus Stadium. The number #1 ranked Hornets are loaded with Big-5 level talent but one players performance stood out for head coach John Ford – Max Boyd. Boyd, who is a team captain was a constant headache for the visiting Packers from Moultrie. From his DT position, he had 12 tackles, 8 assists, 6 TFL’s, 6 QB pressures, one sack, and one forced fumble. Those are impressive numbers from a linebacker, but from a DT those are worthy of the Touchdown Club of Atlanta’s Lineman of the Week for Friday September 9, 2016.